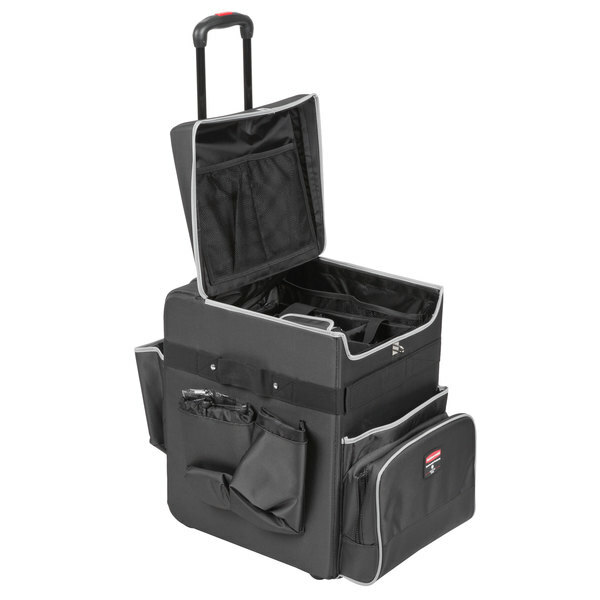 The Quick Cart from Rubbermaid is discreet, compact in design, and has many versatile applications. 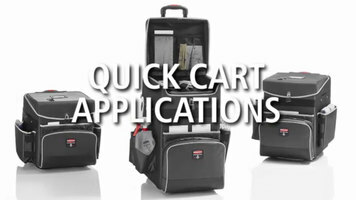 The Quick Cart comes in three sizes and is fully customizable to help adjust to the needs of your property or business. 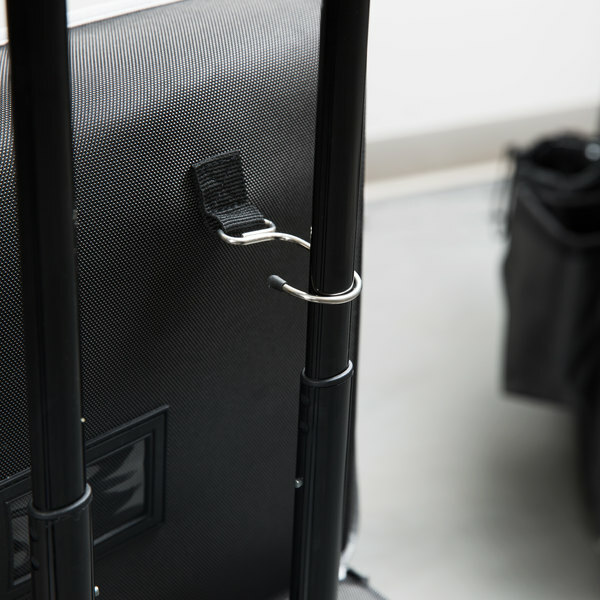 Each cart can be used for cleaning a front lobby, restocking a mini bar, cleaning a fitness room, turndown service in hotel rooms, or carrying tools for property repairs. These Quick Carts are perfect for maintaining a professional appearance while providing a clean environment for your customers. These carts have many applications from use in public areas, guest rooms, or property operations. The compact design allows for easy maneuvering and blends in with the settings of public restrooms, lobbies, and fitness centers. 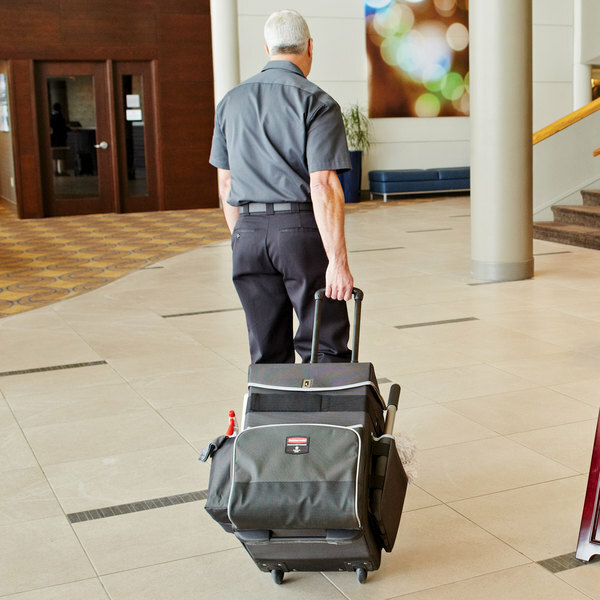 Each cart is perfect for housekeeping in a discreet fashion that minimizes hallway presence yet provides quick, efficient service by allowing your staff to take all the essentials with them. 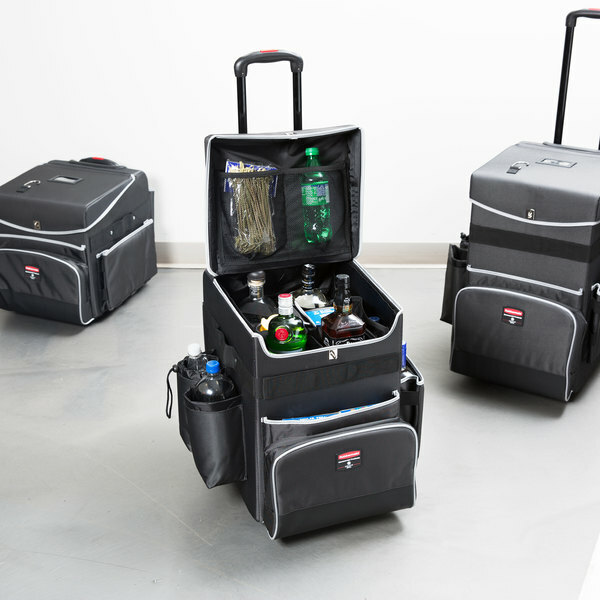 This cart can be used for more than cleaning; it's also perfect for refreshing mini bar supplies and keeping supplies and tools handy. Each cart features durable construction and professional appearance. 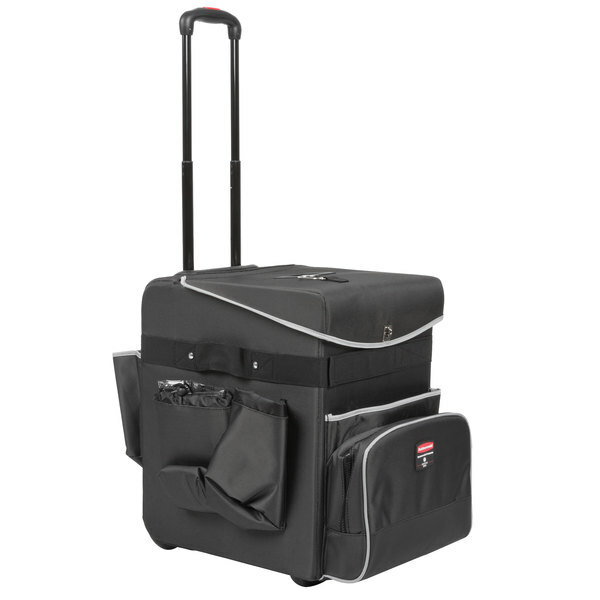 Rubbermaid Quick Carts are the industry's most durable mobile cart solution. 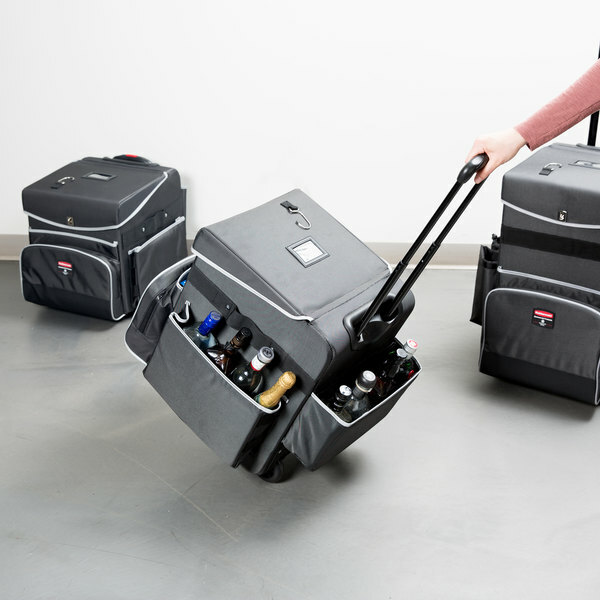 Each cart features high-performance materials, water resistant interior and exterior, a reinforced kick plate, removable liner, removable carry caddy with dividers, and a front pocket with a strap to secure long handled tools. Each cart is fully customizable to configure to the specific needs of your property or business. 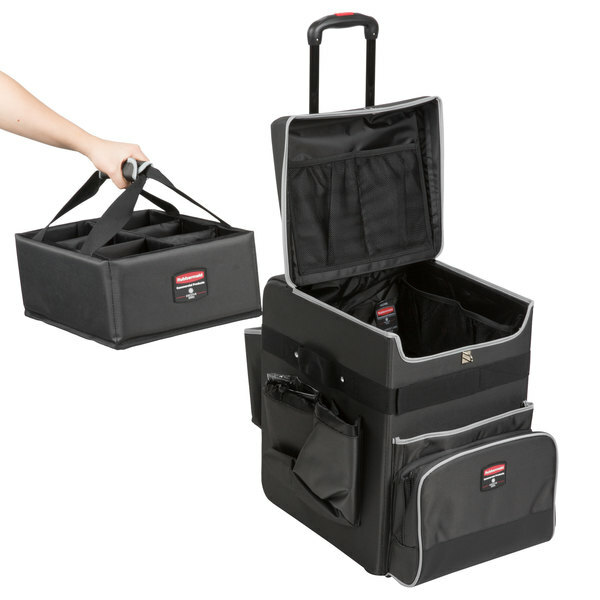 Rubbermaid Quick Carts come in three different sizes all designed to blend into the environment, conceal supplies, and reduce noise to help your staff clean discreetly while maintaining a professional appearance. Empower your team to refresh guest rooms with ease, quickly clean high traffic areas, professionally maintain the property, and stay organized. 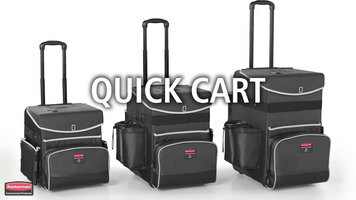 Upgrade to the quick cart from Rubbermaid! 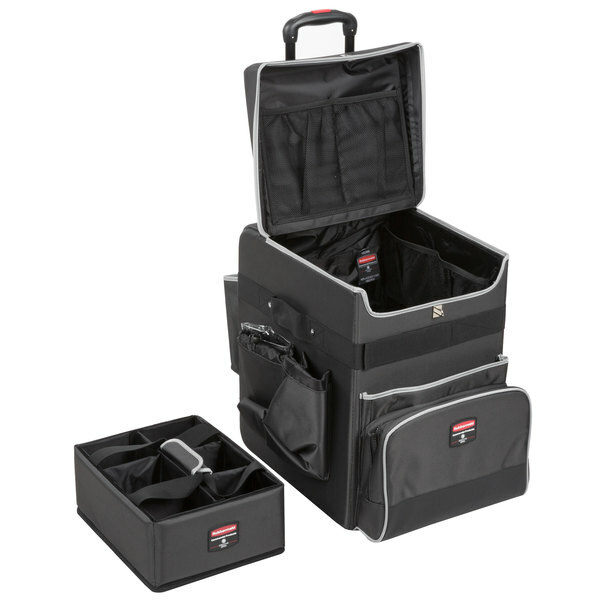 Rubbermaid's Quick Carts are the most durable mobile cart in the industry. Watch this video to find out why these carts are not only the most durable but can also increase your staff's productivity and organization. 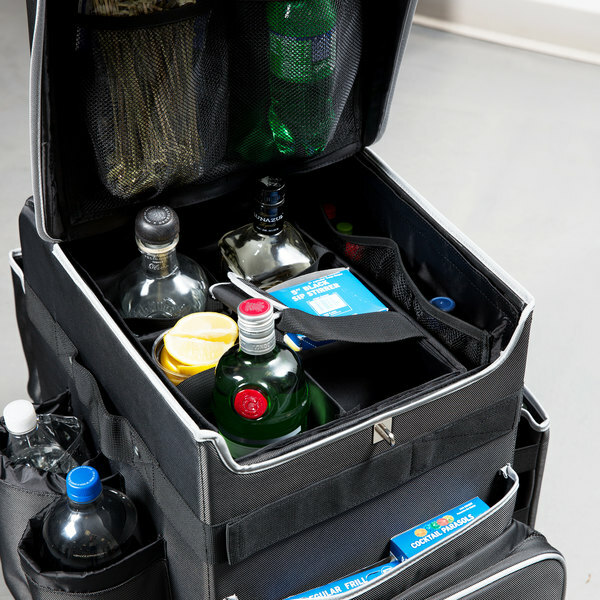 Make cleaning a breeze at your hotel, resort, fine dining establishment, or other facility with this 1902466 Executive quick cart. Designed with a Teflon® fabric protector coating, this sturdy cart's outer shell is designed to repel water, oil, and stains. 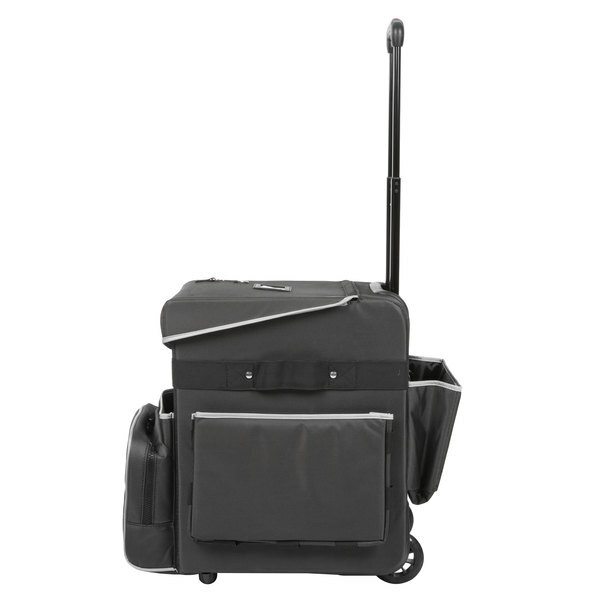 The high performance material provides strength and rigidity that guarantees the ability to withstand long-term heavy use, while the black fabric and subtle design allow allowing this cart to easily blend into upscale environments without the bold aesthetics of a regular janitorial cart. 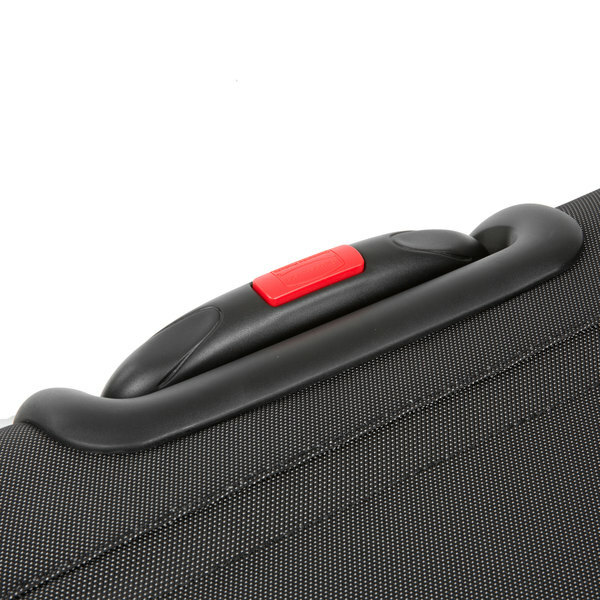 A durable aluminum telescoping handle combines with a compact design to provide comfortable navigation through tight spaces, and robust ball-bearing wheels ensure a quiet and dependable ride. 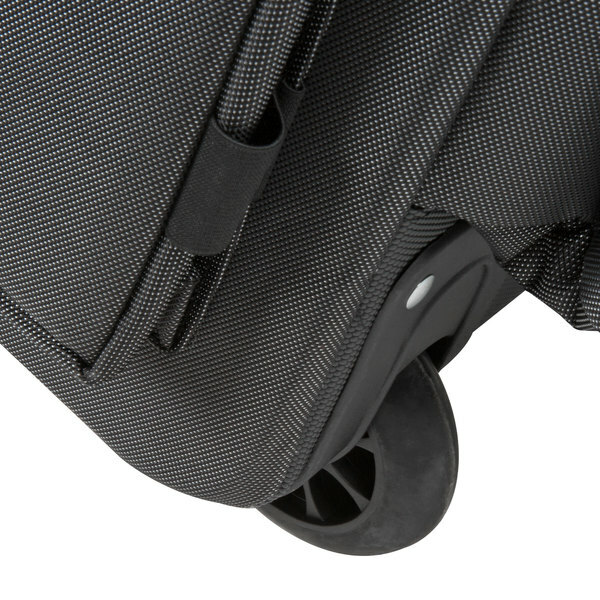 The inner lining of this cart is also treated with a Teflon® fabric protector, and can be removed for easy cleaning and loading. 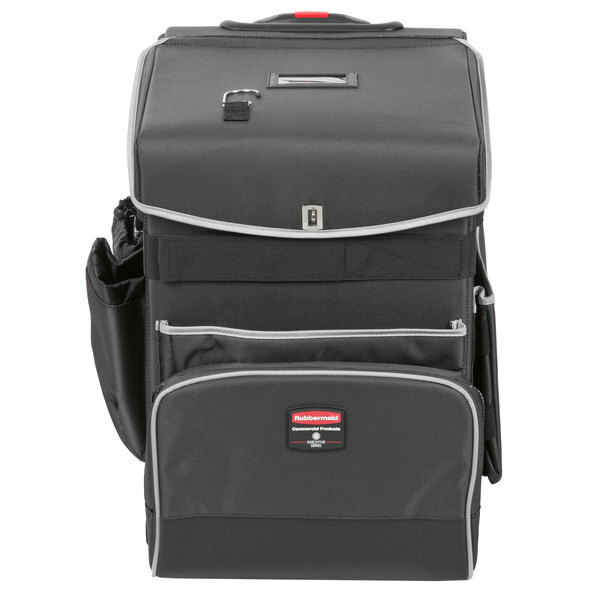 In addition, it features a heavy duty strap and large front pocket that allows for worry-free transportation of mops and brooms. 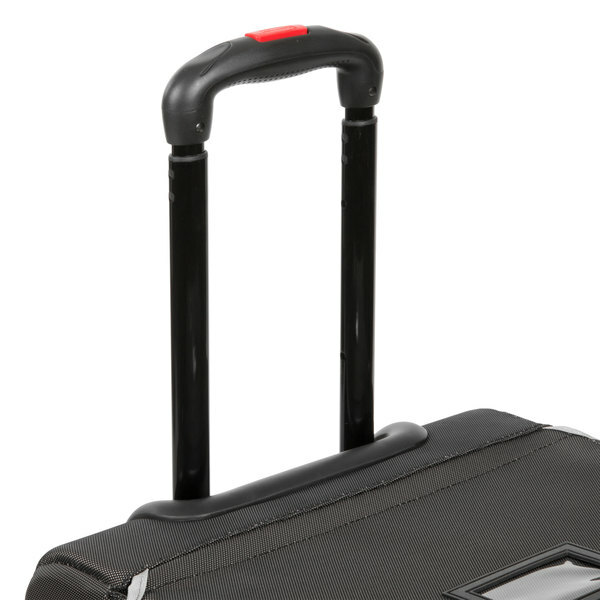 For added ease in operation, this cart has a heavy-duty kick plate on the back to give you extra support when moving. 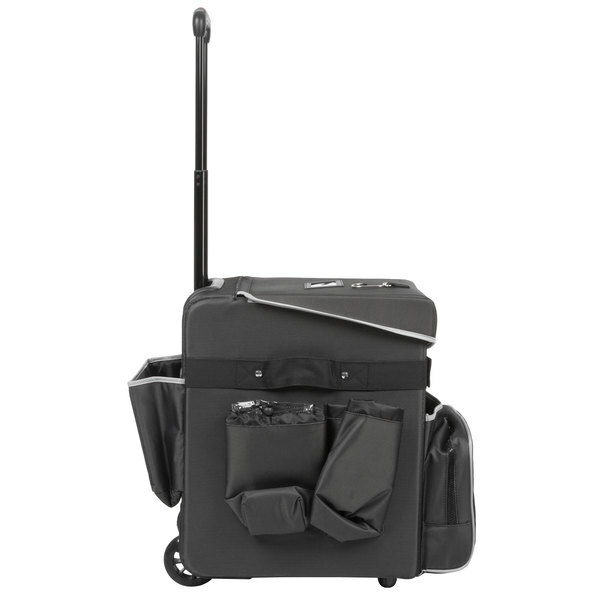 The compact and discreet design of this cart allows it to easily blend-in while performing janitorial work! 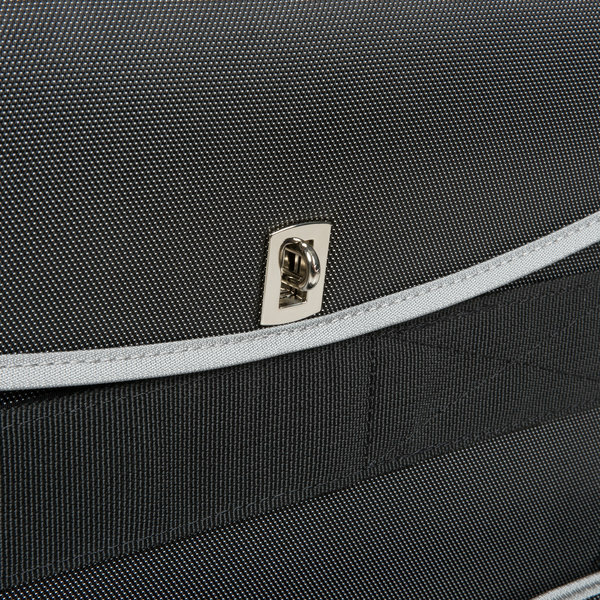 Storage Capacity: 3.1 cu. ft.